My first traumatic brain injury (TBI) occurred more than a decade ago, and since that time, I’ve worked to thrive, to live well in spite of my unique brain injury sequelae. 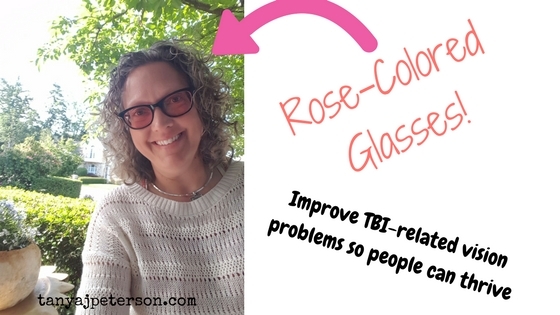 I recently discovered a whole new way to thrive with TBI. I now see the world through rose-colored glasses. TBI can cause different types of visual impairments and disturbances. For me, my already-mediocre vision worsened, I began experiencing double vision, I developed depth-perception issues that exacerbated my normal clumsiness and rendered me unable to properly give high-fives (much to the amusement of my children), I developed significant sensitivity to light (termed photophobia despite the fact that it has nothing to do with fears and phobias), and headaches (I haven’t had a single headache-free day since 2004). Finally connecting with the right eye doctor has improved my vision and my outlook. I truly see the world through rose-colored glasses now. My lenses are special FL-41 lenses. As the picture vividly shows, the lenses are pink. They’re rose-colored. They reduce photophobia and make seeing simply feel better. Light no longer pierces my eyeballs to rush along my optic nerves and sear my brain. Admittedly, I still have a headache, but it’s better. (Said headache could be caused by adjusting to a stronger prescription, adapting to bifocals, and by noises given that my brain is overstimulated by both light and sound). The term “rose-colored glasses” can have a negative connotation, invoking a Pollyana-type image of someone living in denial. It can be an accusation that someone is falsely positive, ignorant of the hardships of life. “Rose-colored glasses” more accurately describes a worldview that acknowledges the negative but intentionally focuses on the positives in life. Someone who sees the world through rose-colored glasses is someone who faces obstacles and challenges and finds ways to move forward anyway. This is a true optimist; wearing rose-colored glasses, he or she has both a why and a how in life—his vision is on the beauty of his purpose. He sees the hues (roses and pinks) of possibility despite obstacles. She has hope. The way we perceive our world is significant for our mental health and wellbeing. My FL-41 rose-colored glasses allow me to appreciate the beauty around me on an even deeper level and to feel physically better as I live a life of purpose and meaning. It’s intriguing to me that this positive treatment is happening now, thirteen years after my initial TBI. After so many years of accepting my vision issues as just a part of a brain injury, I see that there is more that can be done. It’s not too late to seek improvements. 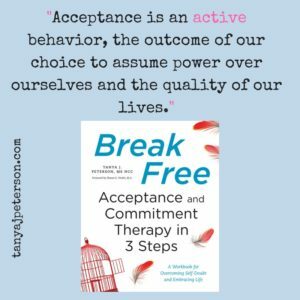 Acceptance is an important concept in the world of mental health. 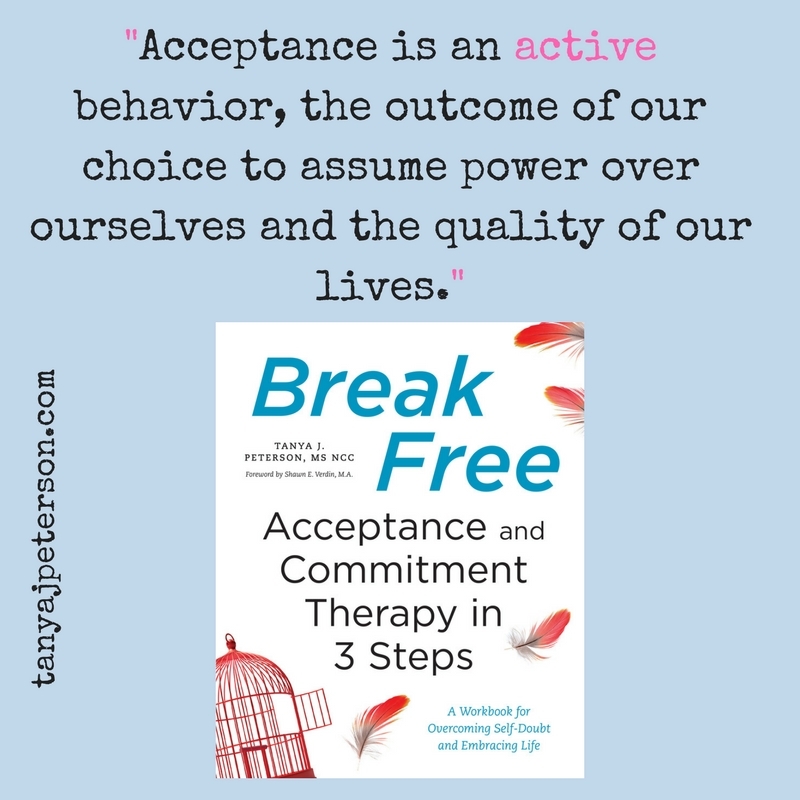 There is even a therapeutic approach that centers on it: acceptance and commitment therapy (ACT). It can be a confusing concept, because like the phrase “rose-colored glasses,” acceptance has different meanings and interpretations. keeping ego at bay (sure, pink lenses in glasses that aren’t sunglasses might not be ultra-fashionable, but I’m willing to accept that in exchange for better vision and functioning). While I am literally seeing the world through rose-colored glasses, it’s just as effective to do so figuratively. Move forward knowing that it’s never too late to make the progress you want to make. Gather tools (for me, one tool is these glasses), intentionally shape your perspective, and create ways to thrive. Whether you’re thriving with TBI or other life challenges, see your world through rose-colored glasses. Tanya, I’m sorry to hear about TBI but glad you are finding tools and the right attitude to deal with each day for what it is. I also had a severe TBI this year on Nov 6 and find myself wigging out a bit trying to just get groceries or go into any store with flourescent lighting. I know I can wear hats, sunglasses, earplugs, etc and am trying that, but I’m wondering, how long should one wear blue, rose, orange glasses? Did you experiment? Is there something special about the type of glass not just color? Any more info would be great, though I realize you wrote this a few years ago. God bless you, and wish you the best for each day in your long recovery. I, too, am sorry to read of your TBI. You are definitely in the very early stages of moving forward, so take it one small step at a time. It’s okay to put a time limit on how long you stay at stores. You don’t have to get your whole list in one trip. Adjusting like this can be one of the most helpful, and most frustrating, things you can do. I’m still wearing my pink glasses. I had them for a year, and because they work so well, at my recent exam, I chose to them again. The eye doctor hasn’t indicated the best length of time to use them. I suspect that it varies from person to person. The lenses are called FL-41. I think there are other tints uses for migraines/TBI, but the FL-41 pink tint has been shown in research studies to work most effectively. It comes in three levels/intensities (my eye doctor offers three, anyway): light, medium, and heavy. I use medium. The heaviest are very dark, and the light seems too light to be effective. My first lenses faded over the summer. I got them in October 2017, and by October 2018, the pink was almost gone. I noticed, too, that my headaches were worse again–which probably means the lenses were doing their job. I think the tint is the key. To my knowledge, the glass/material itself isn’t different. Definitely ask your eye doctor about it, though, because I might be wrong about the material. There might be eye doctors that specialize in TBI problems in your area (they’re too rare, unfortunately, so if there isn’t, a standard eye doctor will be just fine). There’s also vision therapy that can help with certain vision problems related to the brain injury. Even with a severe TBI, though, you might not need it. A consultation with an eye doctor will hopefully provide information tailored to your unique injury. Be patient with yourself. The brain can and does heal, but it takes time and care. Even if you have some lasting effects, you’ll be able to work around them so your quality of life wont’ be compromised.